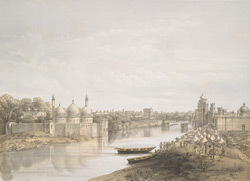 This lithograph is taken from plate 24 from 'General Views of Lucknow' by Sir DS Dodgson. This is the view from the iron bridge looking up the river Gomti towards Chattar Manzil Palace and the Dil Aram. In the left foreground is a battery of artillery. Until the 20th century, there were few bridges across the swift-flowing Gomti at Lucknow. Designed by John Rennie, the iron bridge was purchased by Nawab Saadat Ali Khan, but lay in packing crates for 40 years after its arrival from England. The English bishop Heber visited Lucknow in 1824 and kept a diary of his time there. Bridges, he noted, seemed to have superstitious relevance in the minds of the Nawabs of Avadh. He wrote that when Saadat Ali died, the iron bridge was deemed unlucky and hence stayed unconstructed. When Lord Hastings visited Lucknow in 1814, the handsome stone bridge was decaying. He was informed that the Nawab could not repair it since there was a firm conviction that doing so would result in his death within a year.